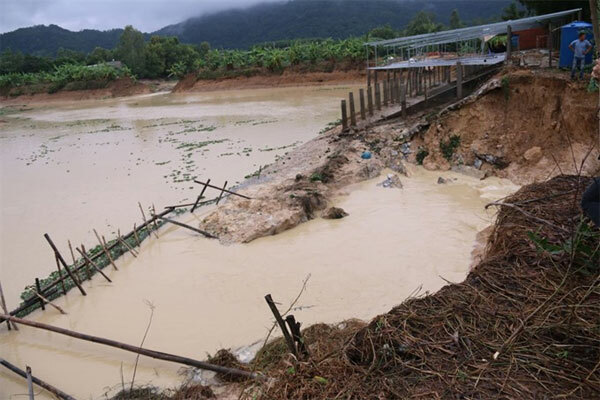 VietNamNet Bridge – Hundreds of households in Phu My Town in southern Ba Ria-Vung Tau Province were flooded due to a broken dam on Monday. The Giao Keo dam was breached due to rising water levels caused by heavy downpours on Sunday and Monday. The waist-high water swept away animals and crops. Nguyen Ngoc Pha, a resident of Toc Tien Commune, said that he lost 70 tonnes of fish, mainly basa weighing 3kg each. Nearly 200 chickens and ducks belonging to nearby resident Bui Kim Diem were also swept away, and houses have been damaged. Tran Dinh On, chairman of Chau Pha Commune’s People’s Committee, said that 30ha of paddy fields and 5ha of farm produce had been destroyed in the villages of Suoi Tre and Tan Le. According to local residents, cracks in the dam were reported to local authorities last year but no action was taken. The water was on us so quickly that we could do nothing to save our crops and animals, said resident Diem. The local road connecting Toc Tien and Chau Pha communes has been heavily flooded. Authorities are waiting for the water to recede to assess the total damage.